Bioinformatics for Beginners provides a coherent and friendly treatment of bioinformatics for any student or scientist within biology who has not routinely performed bioinformatic analysis. The book discusses relevant principles needed to understand the theoretical underpinnings of bioinformatic analysis, and demonstrates with examples targeted analysis using freely available web-based software and publicly available databases. Eschewing non-essential information, the work focuses on principles and hands-on analysis and points to many further study options. 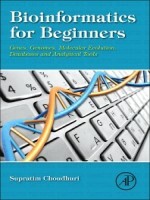 This forthcoming book avoids non-essential coverage yet fully describes the field for beginners - in approximately 200 pages of text, explains the molecular basis of evolution to place bioinformatic analysis in biological context, provides useful links to the vast resource of publicly available bioinformatic databases and analysis tools and proffers over 100 figures aid in concept discovery along with pertinent illustrations.